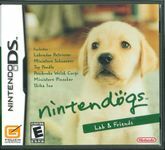 "Give a puppy a new home inside your Nintendo DS! Your favorite breed is waiting, so take one home with you then care for and train it using the Touch Screen and Microphone. Meet other Nintendogs using wireless Bark Mode!"